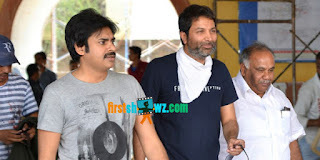 The successful Tollywood combo Pawan Kalyan and Trivikram Srinivas are coming together for another high budget romantic family entertainer that has been under production from a while now. According to the latest update, the film has wrapped up 50% of the shooting schedules and the makers are expected to announce the title, teaser and release dates of the film sooner. Pawan Kalyan is pairing up with young heroines Anu Emmanuel and Keerthy Suresh in the yet-to-be titled flick being produced by S Radhakrishna under Haarika and Hassinne Creations banner. Anirudh Ravichander is making Tollywood debut with this movie.